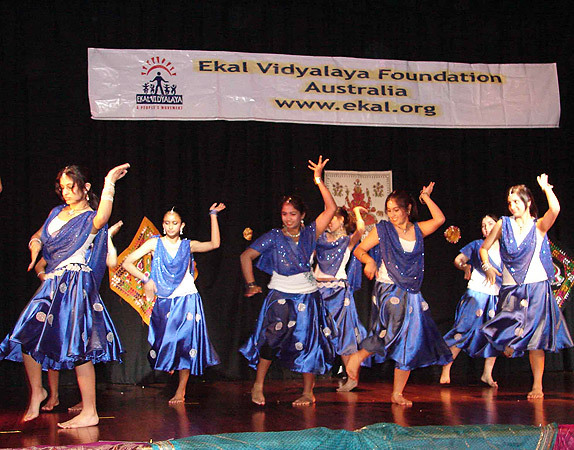 Ekal Vidyalaya Foundation (EVF) of Australia organized “Ekal Nite – Baltarang, an IndoKids cultural extravaganza” on 19th May. It featured cultural programs from different states of India presented by twelve leading choreographers from Sydney’s Indian community. Around 165 children participated in the event. The entire program was coordinated skilfully by them with children acting as the MC (master of ceremonies) as well. 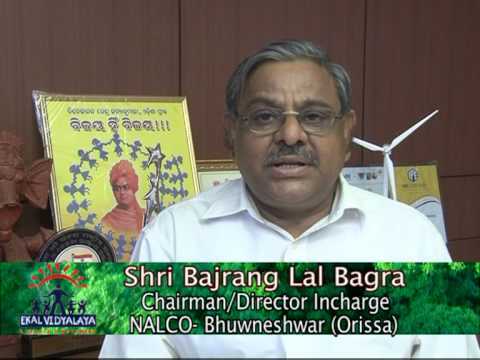 Shri Raghavji, Finance and Planning Minister – Government of Madhya Pradesh, India was the chief guest. He expressed his deep appreciation of the work done by Ekal Vidyalaya Foundation worldwide, and particularly in Australia, for the upliftment of tribal people of India. Around 800 people attended the grand event, and everyone involved, from volunteers to participants to members of the audience enjoyed the evening thoroughly. The main aim of the function was to generate awareness in Australia about EVF Australia’s activities, which it certainly achieved in great measure thanks to the selfless efforts of the choreographers, children and volunteers. In addition, the function generated enough proceeds to sponsor around 17 schools to educate about 500 children in tribal villages of India. And it showed how beautifully children in Australia could reach out to their tribal brethren in India, in such a wonderful and constructive manner! “Path to Peace” – the annual fundraising event in West Virginia concluded successfully. The amazing performance by Sridhar Shanmugan and his troupe received a standing ovation from the audience of 150 people, comprising equally of Indo-Americans and non-Indo-Americans. 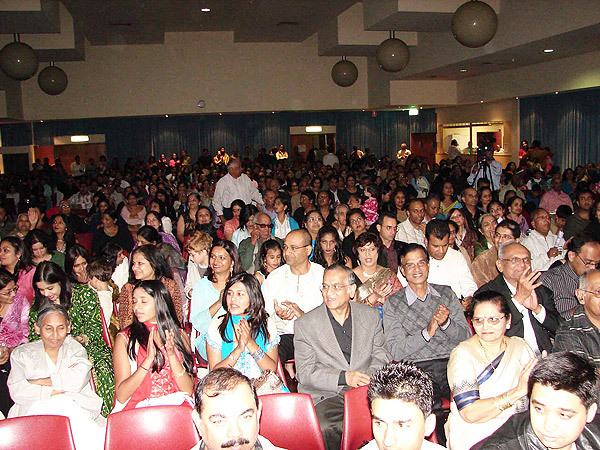 Given the small size of the IndoAmerican community in West Virginia, the audience numbers were sizeable and indicative of the broadening support base for the Ekal Movement. 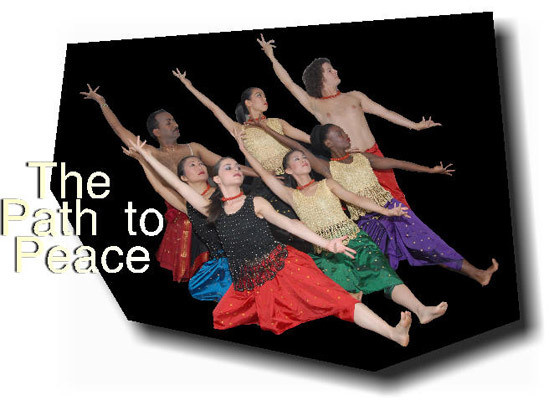 Ekal Vidyalaya Foundation (EVF) - USA with many Georgia support-organizations, joined hands in presenting a multi media fusion dance, music and drama concert , 'The Path to Peace', to a diverse group of the American community and Indian American community. The Concert, honoring Mahatma Gandhi's commitment to humanity and rural education, was presented at the Rialto Center for the Performing Arts, Atlanta, on June 23. Master of Ceremonies, Viren Mayani, extended a warm welcome to all and invited Chander Aggarwal, Vice- President, South-East Region, EVF, and Giriraj Rao, co-Founder and Executive Director, Gandhi Foundation USA (GFUSA) and recent recipient of the 2007 Governor's Award for Humanities, to extend a formal welcome to the audience. Chander Aggarwal emphasized how enriching this joint-venture between EVF and GFUSA has been for the Indian American community. 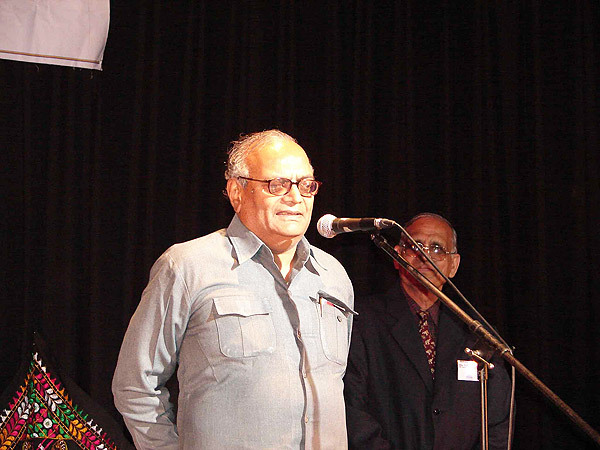 On June 9th 2007 Dr. Ramesh K. Gupta served on the panel for Volunteerism/Service Commitment at the 2007 Hugh O' Brian Youth (HOBY) Leadership seminar at the George Washington University, Mount Vernon Campus. The panel discussed the topic - "Is the Community Service only a Staple of Western Societies?" Dr Gupta emphasized that volunteerism and community service are important part of human enterprise from the beginning of time and have helped human race to a path of progress all over the world despite many difficulties and challenges.He explained important role organizations like Ekal Foundation are playing in educating the under served in India through relatively small contributions per donor ($365/year/school), a very small administrative expense ratio through commitment and dedication of its volunteers and donors. He accepted a Certification of Appreciation from HOBY on behalf of Ekal Foundation, DC Chapter, for "...continued dedication, and commitment to motivating and empowering individuals to make a positive difference within our global society through understanding and action based on effective and compassionate leadership." EVF India's USA Co-ordinator - Mr. Pradeep goyal is currently visiting the US. He will be there till 20th July 2007. YOUTH FOR SEVA (YFS) launched its website www.yfsindia.org on 4th June 2007. Suggestions are invited so that the content of the website can be enhanced and missing information included. The website will slowly be made into a centre point of activity for YFS providing all information on ongoing activities at different chapters as well as providing an opportunity to grow the organisation. Youth For Seva was started in 2000 in Kolkata and has spread through many towns and cities. It holds its All India Youth Meet regularly once a year and the next such meet is scheduled on 8 th- 9th September 2007 at Raipur. Youth and people associated & willing to join this movement are welcome to be part of the meet and join the movement. Registration will start on the website from Monday 9th July 2007 onwards. 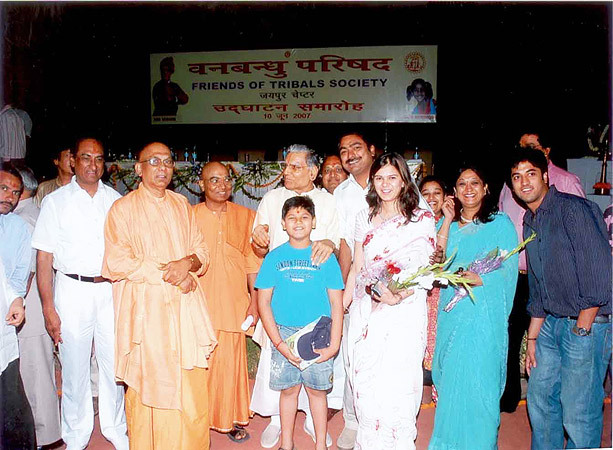 The Jaipur Chapter of FTS was inaugurated on 10th June, 2007 in a grand function held at the Maharana Pratap Auditorium. 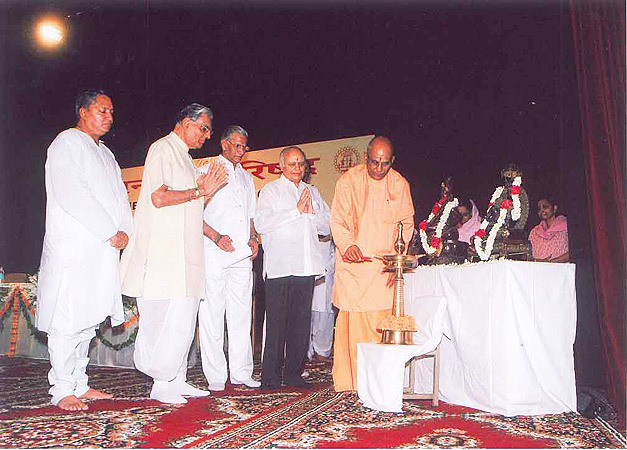 Swami Jitatmanandaji Maharaj was the chief guest at the glittering ceremony. Recalling Swami Vivekananda’s vision, he asked all to emulate his inspirational life and work towards the upliftment and progress of our nation. 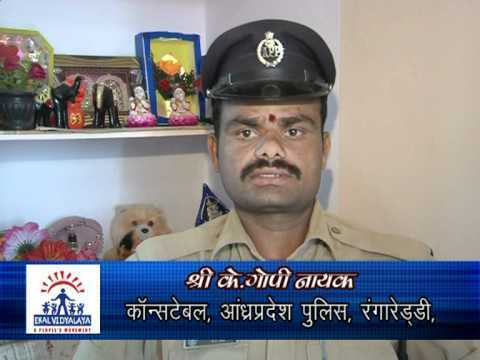 He appreciated the pioneering work being carried out by the Ekal Movement in this sphere. Mr. Sohan Goyenka (President, HongKong chapter of EVF) gave a big boost to the newly formed chapter committee by his inspiring presence. Eminent members of Jaipur’s elite joined the Ekal Movement, among them Shri Vimal Chand Surana (patron FTS Jaipur), Shri Jugal Kishor Derewala (President FTS Jaipur), Shri Om Dangayatch (Vice-President FTS Jaipur), Shri Pradeep Baheti (Secretary, FTS Jaipur), Shri Gopal Prasad Gupta (Treasurer, FTS Jaipur). 568 Ekal Vidyalas were adopted on the spot, with commitments for many more being received. The highlight of the inauguration of the Jaipur Chapter was the donation for 5 Ekal Vidyalayas made by Master Shashwat Gupta, all of 9 years old. The son of Shrimati Deepti Gupta and Shri Pradeep Gupta, Shashwat studies in class IV , Mayo College. He donated his entire life’s savings (all the money he has collected since his birth) for this noble cause. On this occasion, Swami Jitamananda blessed Shashwat and indeed all in the gathering were deeply impressed by the dedication of this young child. 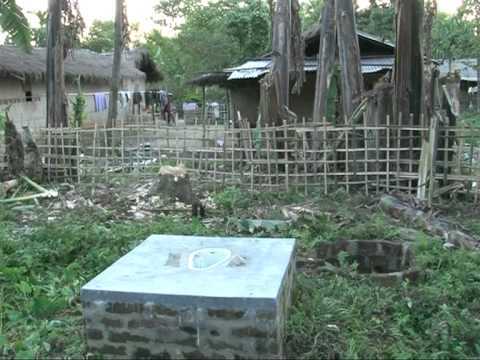 Since the inception of Friends of Tribal Society in 1989, the unique concept of "Nagar Sangathan" through which the urban elite have significantly contributed towards Ekal growth was institutionalized. Mahila Sangathan and Yuva Sangathan are the two pillars of Nagar Sangathan. The uniqueness of this concept is the way it acts as a bridge between remote India and urban India. Towards making this "Sangathan" more effective and result-oriented, periodical conferences, trainings and workshops are held. 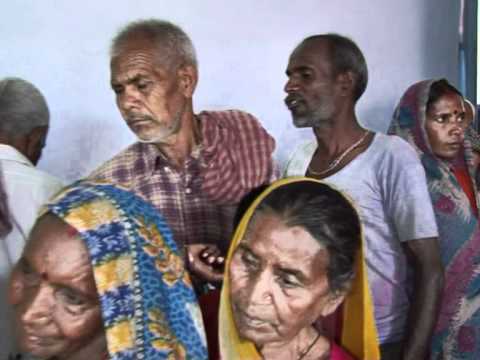 Hence the "Kendriya Sangathan Varg", a two day extensive workshop held on 19-20th June in Birsa Seva Gram, Project Karanjo, Chakradharpur, Jharkhand. 43 volunteers participated in the workshop where they attended various sessions. The main topics discussed and formalized during the workshop were - Vanyatra/Ekal Visits, Sangathan/Organizational Strength, Karyakram/Program, Svavlamban sangrah/Collection, Karyakarta Welfare. The training programs and courses devised as a result of this workshop will now be conducted by these 43 volunteers or master trainers all over the country as per the schedule and itinerary worked out during the workshop. The courses will be imparted at four levels - COC (chapter orientation course), AOC (Anchal Orientation Course), SOC (Sanch/Sankul Orientation Course), GSV (Gram Samiti Varg). The Central Karyakarta Toli Meet was held in Birsa Seva Prakalp, Karanjo, Chakradharpur, Jharkhand from 21st-25th June, 2007. The decisions taken at the Chintan Varg and National Core Group (NCG) meet held earlier this year in May were shared with the CKT team comprising of all zonal area in-charge, subject in-charge, training in-charge and Abhiyan Management team. Through vigorous discussions lasting from morning till night and various sessions on different subjects a time-bound implementation plan was worked out by the CKT members. The annual meeting of Ekal Vidyalaya Foundation will be held from 21-23 September 2007 in Orlando, Florida. A detailed agenda will be sent out by end of July. Please contact ekalusa@ekalvidya.org for further details. 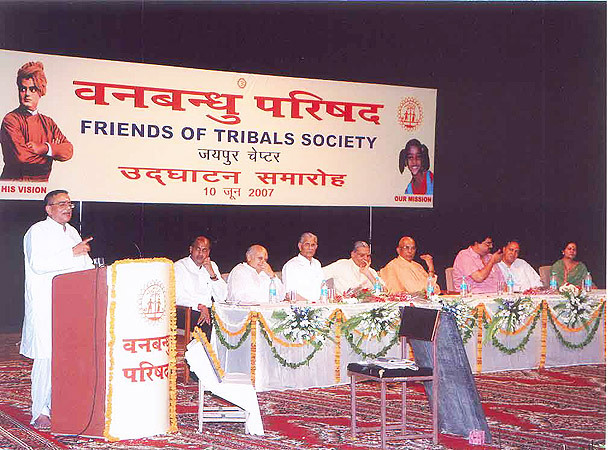 The Coimbatore Chapter of Friends of Tribal Society will be inaugurated on 15th July, 2007. The next All India Mahila Nagar Sangathan Varga (Urban Ladies Conference) will take place at Ranchi (Jharkhand) on 4th and 5th August 2007. A workshop was held in Raigarh Anchal where 90 Arogya Sevikas from tribal villages in Raigarh Anchal itself were trained. Eminent doctors from Raigarh - Dr. Shuchi Tripathi, Dr. Lokesh Shadangi, Dr. Uraon trained the Arogya Sevikas over 3 days on health and hygiene covering nutrition, cleanliness, locally occurring ailments like malaria and skin diseases. On this occasion local businessmen from Raigarh gifted thermometers and utensils to the Arogya Sevikas. 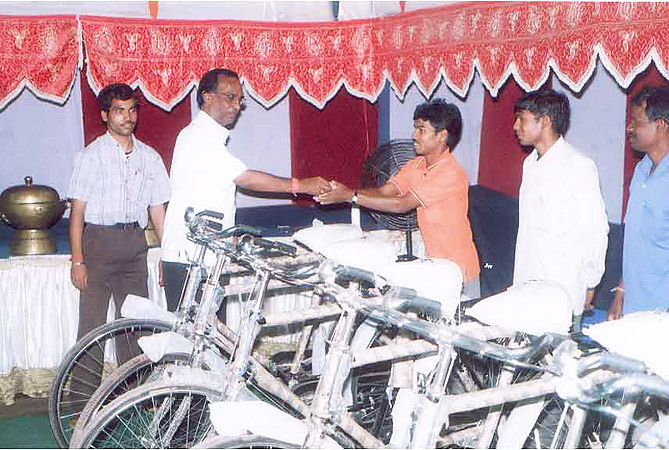 The FTS Chapter of Raipur donated 114 cycles to the Anchal full-time volunteers on this occasion.